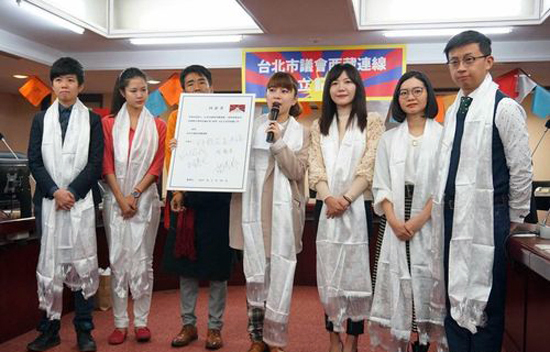 (TibetanReview.net, Mar16’19) – A group of 13 councilors belonging to the pan-green camp has announced on Mar 14 the formation of a Tibet caucus in the Taipei City Council, their agenda being to lend greater support to Tibet and its people, reported Taiwan’s CNA news agency Mar 14. The members were stated to include Lin Liang-chun, Lin Ying-meng and Huang Yu-fen of the New Power Party, Wu Pei-yi of the Democratic Progressive Party, Miao Po-ya of the Social Democratic Party, and the independent Chiu Wei-chieh. Lin Ying-meng is the group’s convener and Wu her deputy, it was stated to have been announced. Lin has said supporting-members decided to establish the group despite criticisms, noting that many countries had voiced support for Tibet during the 60th anniversary of the Tibetan uprising against Chinese rule, which was observed globally on Mar 10, including in Taipei. Lin has said Taipei City is home to around 100 Tibetans and wanted the city government to draft a set of regulations to cater to their educational and housing needs. She has proposed designating Mar 10 as Tibet human rights day and helping Tibetans hold activities to commemorate the uprising. Wu has said the Tibet caucus will help Taiwan reach out through city-to-city exchanges with focus on issues related to human rights. She has expressed disappointment that Taipei Mayor Ko Wen-je, an independent, did not make an official statement on the Tibetan Uprising Day.